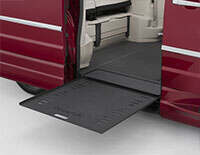 You have several wheelchair van conversion styles available to consider when choosing the right wheelchair ramp van for you. To begin, let's take a look at some key terms you will see us use when discussing wheelchair accessible vans. For an adult person in a wheelchair to easily enter a vehicle and sit completely upright while riding, the floor of the minivan is dropped by as much as 14". This structural modification is commonly referred to as being a "lowered floor conversion". The increased interior height from having a lowered floor also helps the able-bodied caregiver with loading and securement assistance. It also provides for a reduced ramp angle. The foldout is the most common type of conversion being used today. Foldout ramps can be either manually operated or powered depending on the design. A foldout ramp rests upright along the inside of the closed sliding door when not in use. Foldout ramps cab easily be deployed over a curb or onto a sidewalk. With an in-floor ramp conversion, the ramp is stored in the floor (under the vehicle). With no ramp in the doorway, passengers who are not in wheelchairs can enter and exit the vehicle without having to deploy the ramp. An in-floor ramp conversion can be either powered or manual. The power in-floor is typically going to be higher in cost than a fold-out conversion. One of the most important choices you will make in selecting a handicap accessible wheelchair van is side-entry versus rear entry. Your choice will impact such things as the wheelchair seating positions, your ability to accommodate other passengers and parking options. 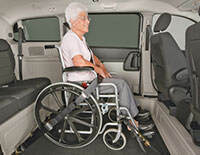 Side-entry wheelchair vans represent the majority of the market; however, rear-entry wheelchair vans have also gained in popularity over the years. A side-entry van allows for the ability to enter and exit safely onto the curbside away from traffic. The wheelchair user can either drive from a wheelchair or sit in the front passenger position. Side-entry vans give extra room for maneuverability and also maintain the rear cargo storage space behind the third-row seating. A rear-entry vehicle can be parked in any parking space---no extra room is required for a ramp (excluding parallel parking). 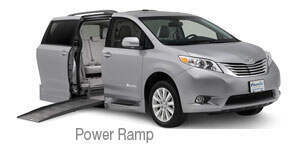 A rear-entry vehicle offers plenty of ground clearance because most of the van's floor has not been modified (the wheelchair user rides in a channel installed in the middle of the floor, from the second row to the rear of the vehicle), and the rear of the vehicle is slightly elevated. In addition, a rear-entry vehicle is typically less expensive to convert. 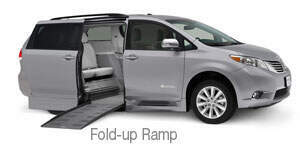 Another important consideration to make is whether you'd prefer a fold-up or an in-floor wheelchair ramp in your handicap van. Fold-up ramps fold in half and stow upright, next to the side passenger door. 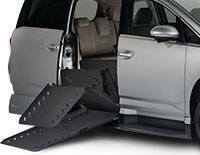 In-floor ramps slide into a pocket underneath the vehicle's floor. 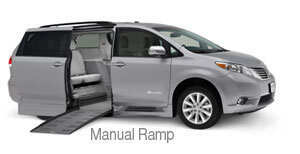 In-floor and fold-up wheelchair ramps are available in a wide range of wheelchair accessible minivan conversions. People who prefer an in-floor ramp prefer the ramp to be out of the way of the passenger entrance. Typically, fold-up ramps tend to be less expensive and easier to maintain, and they present a lower ramp angle. Wheelchair accessible conversion with power wheelchair ramps and doors are the most popular because of their ease and convenience. However, manual conversions are also popular because they cost less both to purchase and to maintain. Power conversions typically have a kneeling feature that reduces the angle or steepness of the wheelchair ramp. By compressing the suspension, the floor of the van lowers on the ramp side. Manual ramps are ideal for a wheelchair user who will always travel with a companion who can access and raise/lower the ramp easily. Manual ramps are cost efficient, as they do not have any automated components. 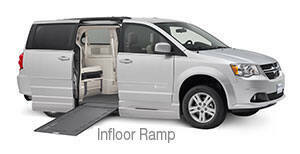 Power ramps are very convenient to use as the door/ramp are operated with a key fob remote control. As a result, caretakers can avoid repetitive transfers.